Help is on the way, Kermie. You’re not dead, are you, Kermie? Its not easy being green….. If I can take Ambers’ comment one step further- it isn’t easy KEEPING green. Who will be the next Jim Henson to lift all of us symbolic Kermies up and over this disgraceful abyss we’ve been led into!! Talk about a for real puppet government- ye gaads the last 8 years. When we had a dog, she got ahold of our Kermit the Frog and gave him a lobotomy. He was never the same after that. It isn’t being green, Amber nor keeping green, BL but just imagine how hard Kermie’s life would be with a dog owned by S.Le! Another brutal day here. Come to think of it a lobotomy sounds like a good thing. I would rather a bottle in front of me than a frontal labotomy. What an encouraging repertoire of choices here – lobotomy vs. a bottle. 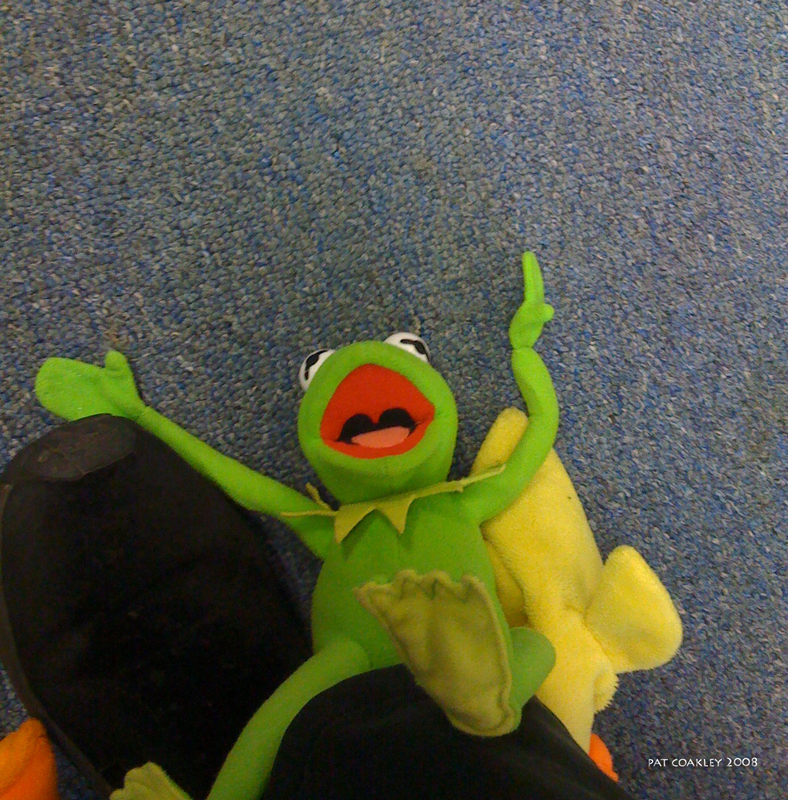 Poor Kermie *sniff* did he break a leg or survive the fall… WAIT is he just excited to see you so he rolled around on the floor? Yers, that’s it isn’t it! NKGee, you gave that up, remember? Nava, I like your strategy: water is cheaper than pigment. I think I’m gonna post in the future about “tips” from frugal artists! SF: Yers, that’s it, Pollyanna! I like your version better.